13:1 The same day went Yeshua (ישוע) out of the house, and sat by the sea side. 13:2 And great multitudes were gathered together to him, so that he went into a ship, and sat; and the whole multitude stood on the shore. 13:6 And when the shemesh (sun) was up, they were scorched; and because they had no root, they withered away. 13:8 But other fell into adamah goodah , and brought forth fruit, some an hundredfold, some sixtyfold, some thirtyfold. "Why do You speak to them in meshalim (parables)? 13:13 Therefore speak I to them in meshalim (parables): because they seeing see not; and hearing they hear not, neither do they understand. That many Nevi'im and righteous [men] have desired to see [those things] which you see, and have not seen [them]; and to hear [those things] which you hear, and have not heard [them]. 13:19 When any one hears the word of the kingdom, and understands [it] not, then comes the wicked [one], and catches away that which was sown in his heart. This is he which received seed by the way side. 13:22 He also that received seed among the thorns is he that hears the word; and the care of this Olam Hazeh, and the deceitfulness of riches, choke the word, and he becomes unfruitful. 13:23 But he that received seed into the adamah Tovah is he that hears the word, and understands [it]; which also bears fruit, and bringeth forth, some an hundredfold, some sixty, some thirty. 13:27 So the servants of the householder came and said to him, Sir, didst not thou sow good seed in thy field? from whence then has it tares? 13:28 He said to them, An enemy has done this. The servants said to him, Wilt thou then that we go and gather them up? 13:29 But he said, Nay; lest while you gather up the tares, you root up also the wheat with them. 13:30 Let both grow together until the harvest: and in the time of harvest I will say to the reapers, Gather you together first the tares, and bind them in bundles to burn them: but gather the wheat into my barn. 13:32 Which indeed is the least of all seeds: but when it is grown, it is the greatest among herbs, and becomes a tree, so that the birds of the air come and lodge in the branches thereof. 13:33 Another parable spoke he to them; The Malkut Shamayim is like to leaven, which a woman took, and hid in three measures of meal, till the whole was leavened. 13:35 That it might be fulfilled which was spoken by the Navi, saying, I will open my mouth in meshalim (parables); I will utter things which have been kept secret from the foundation of the Olam Hazeh. 13:36 Then Yeshua (ישוע) sent the multitude away, and went into the bayit: and his Talmidim came to him, saying, Declare to us the parable of the tares of the field. 13:39 The enemy that sowed them is the devil; the harvest is the end of the Olam Hazeh; and the reapers are the malakhim. 13:40 As therefore the tares are gathered and burned in the fire; so shall it be in the end of this Olam Hazeh. 13:43 Then shall the righteous shine forth as the shemesh (sun) in the Malkut their Father. Who has ears to hear, let him hear. 13:44 Again, the Malkut Shamayim is like to treasure hid in a field; the which when a man has found, he hides, and for joy thereof goeth and sells all that he has, and buys that field. Therefore every scribe [which is] instructed to the Malkut Shamayim is like to a man [that is] an householder, which brings forth out of his treasure [things] new and old. 13:53 And it came to pass, [that] when Yeshua (ישוע) had finished these meshalim (parables), he departed thence. 13:54 And when He was come into his own country, He taught them in their synagogue, insomuch that they were astonished, and said, Whence has this [man] this wisdom, and [these] mighty works? 13:55 Is not this the carpenter's son? is not his mother called Miriyam? and his brethren, Yaakov, and Yosef, and Shimon, and Yehudah? 13:56 And his sisters, are they not all with us? Whence then has this [man] all these things? 13:57 And they were offended in Him. But Yeshua (ישוע) said to them, A Navi is not without honour, save in his own country, and in his own house. 22 "Adonai ELOHIM says, 'From the top of this tall cedar, from its highest branch, I will take a shoot and plant it myself on a high and prominent mountain. 23 I will plant it on the highest mountain in Isra'el, where it will put out branches, bear fruit, and become a noble cedar. Under it will live all kinds of birds; winged creatures of every description will live there in the shadow of its branches. 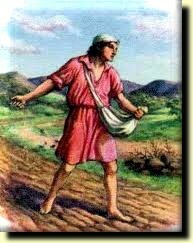 The farmer that Yehoshua (יהושע)talked about is the one who brings Elohim (אלהים)'s message to others. The seed that fell on the hard path represents those who hear the message, but then the Devil comes and steals it away and prevents them from believing and being saved. The rocky soil represents those who hear the message with joy. But like young plants in such soil, their roots don't go very deep. They believe for a while, but they wilt when the hot winds of testing blow. the good soil represents honest, good-hearted people who hear Elohim (אלהים)'s message, cling to it, and steadily produce a huge harvest.